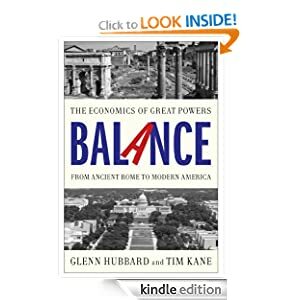 The Balance blog is authored by Glenn Hubbard and Tim Kane. The authors established the blog during the summer of 2012 to share ideas about the economic decline of great powers which is the subject of their book – Balance: Why Great Powers Lose It and How America Can Regain It – under contract with Simon & Schuster. Are you planning to set up an RSS feed? Hi Colin. We are using WordPress, so setting up RSS should be easy, huh? I thought it was automatic. Will look into it now. Update: From WordPress Support: “Every WordPress.com blog has multiple feeds. The main content feed can be accessed by adding /feed/ to your blog’s URL.” So, try click on balanceofeconomics.com/feed/. Thanks. Excellent. Thank you. Looking forward to reading. Definitely adding this to my feed! I’m currently an economics student at Glenn’s alma mater, UCF. I look forward to bringing some of the content and discussions on here into the classroom with my fellow classmates and professors. Yes, please setup an RSS feed. BTW: Very much enjoyed (if that’s the right word) the writings on Personal Command mismanagement. At least I know I’m not alone.